The government has urged Rwandans to focus on preventing oral diseases rather than waiting for treatment when they fall sick. The call was made by the Ministry of health yesterday at the occasion to mark World Oral Health Day 2019. Irene Bagahirwa, in charge of Oral Health at Rwanda Biomedical Centre said that while the number of patients seeking for treatment of oral diseases is on the rise, there is no culture of routine preventive measures. "We urge Rwandans to priotise preventive measures. A toothbrush and toothpaste which last just one month are cheaper than a bottle of mutzig beer... Oral health is a key to the whole body health," she said. According to official statistics, the number of patients who sought for treatment of oral diseases increased from 500,000 in 2016 to 700,000 cases in 2018. The Ministry attributes the rise of numbers to sustained campaigns, which helped change the mind sets of Rwandans. "People are increasingly getting aware of the availability of dental health services and how they can access them, and they massively going to hospitals to get treated. Dental health services are available from health centres and up, and they are covered by Mutuelle de santé," she said. 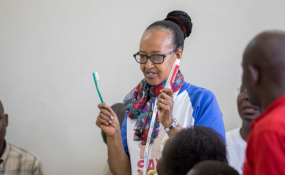 Adelaide Muhiganwa a dental surgeon at Legacy Clinic and a representative of dental surgeons Association in Rwanda said most people think dental diseases don't kill, but they slowly take lives. "Dental diseases themselves don't kill, but their complications do. Among these complications there are Non-Communicable Diseases, which are much dangerous to the health," she said. Muhiganwa said the mouth is a conducive environment for a lot of types of microbes compared to other parts of the body. These germs are responsible of causing various dental diseases like dental decay, gum diseases and dental caries among others, she said. Besides, these microbes reach nerves and veins which link the teeth to various parts of the body, she added. "They can reach the heart, lungs, brain, kidney and other various organs then start to attack them" she said, adding "Most people wash their teeth when they wake up, and eat their breakfast and rush to work. It's not right because every person has brush after every meal. If it's not the case, it's an opportunity for microbes to work hard and excavate teeth the whole day, then reach the nerves."